KLCB 1230 AM Radio aires a Country music format, targeting a broad-based demographic of 18-54 year olds. Coverage area is a 25-mile radius of Libby. 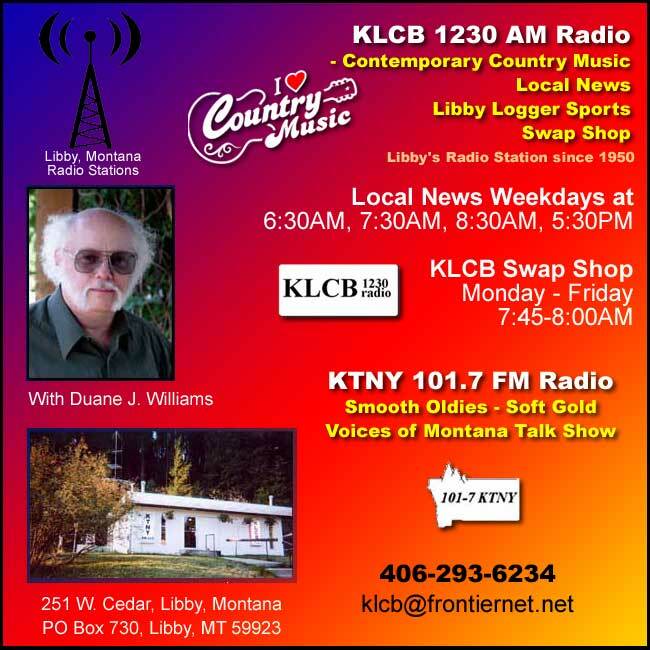 In addition to its usual music programming, KLCB carries national and local news, a swap and shop program, plus Libby Loggers football and men's and women's basketball games. KTNY 101.7 FM Radio aires Smooth Oldies and Soft Gold 60, 70, 80, 90s hits, music with massive appeal to the 35-54 demographic. Not easy listening; Easy to listen to. KTNY serves Libby and south Lincoln County. Coverage area is a 25-mile radius of Libby. Program features include ABC Entertainment Network, National news hourly, locally-produced state and local news, Rush Limbaugh, and Voices of Montana (a state-wide call-in talk show).